As we move on to Maharashtra, we have so many to select from. Again going by the Indian Bread that I wanted to choose from, I instantly opted to make Thalipeeth. This is a long pending dish on my to do list. Ever since Roti Mela happened, I had this marked on my list. Finally, after so many years, I do it now and so pleased that I have something very unique to showcase this state. Unfortunately when one thinks of Maharashtra, Bombay is what comes to mind and we sort of settle in that place. I am guilty of not moving beyond this city to actually explore what else is famous in the other cities. Anyway, the chats are famous and I even had a link that talks about 40 dishes that one can not miss eating in Bombay. Yes, it will always be Bombay as it is Madras for me. Bombay and Pune always remind me of my single visit to the place. This was nearly two decades ago, with my parents for a family friend’s wedding. They were Punjabis, so I got to taste Punjabi and Bombay food during our visit. I am sure the place has changed so much that I would hardly recognize. However the food I ate during my visit will forever be fresh and same. So coming to the Maharashtrian meal for the day, I made the Thalipeeth and Thecha. As I read about Thalipeeth, it is normally served with Green chutney and Thecha, which is again ground / pounded green chilies with garlic. I was planning on making all these dishes, in the end, made only Thecha and served mango pickle, curds. 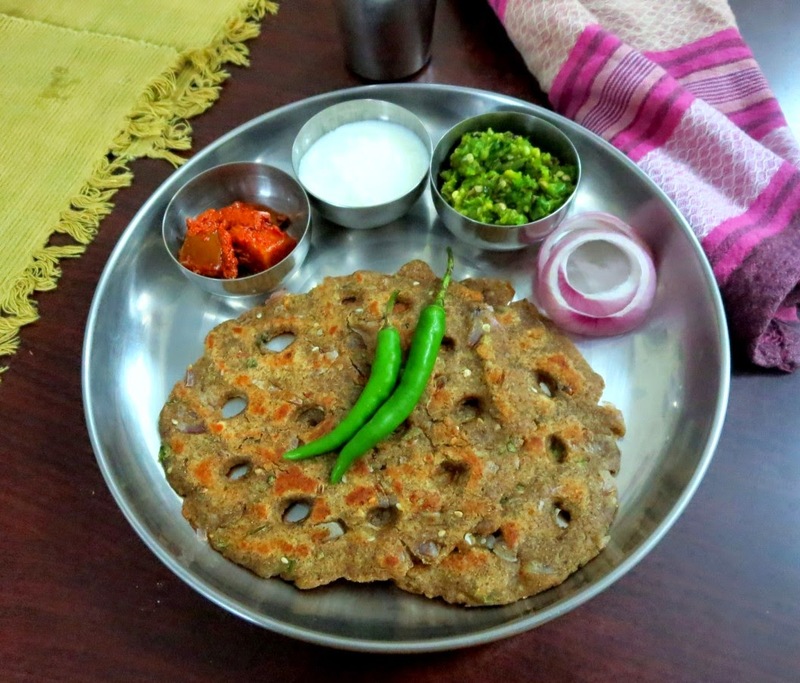 Thalipeeths is made with Bhajani or Thalipeeth flour. This flour is normally sold as such in Mumbai market. This is a mix of all whole grains which can be easily made at home if you have these flours ready. As I read about how to make this at home, I resorted to making this flour with the ready made flours I had in my pantry. As with most recipes, there are so many varieties to make this bhajani flour. I sort of a mixed couple of recipes together and ended up making it. Reading on making the thalipeeth from the different online resource and blogs from here, here, here and here, helped me making this dish. I only hope I met the original dish. 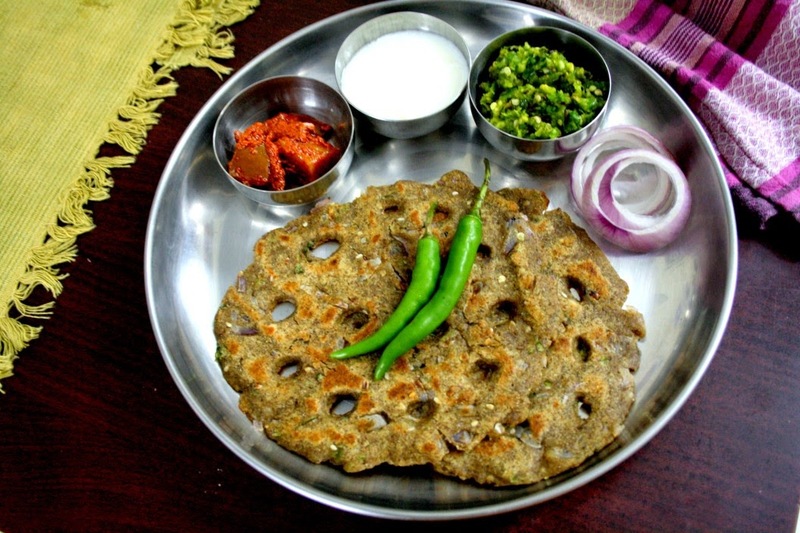 The pattern used to make this roti is also different, as holes are made on the top to enhance better cooking all over. The rotis can be made thick or thin, however using so many flours, one has to make sure it gets cooked well. First I tried making the holes after placing the rotis on the tawa, then realized pressing down holes when it’s still on the board, works out even much better. In a big bowl take all the flours. Add finely chopped onions, green chili paste, chopped coriander, sesame seeds, groundnut, coriander powder, cumin powder, red chili powder and salt and mix well. Add warm water to the bowl and knead it to a soft dough.The dough will be slightly sticky because the combination of various flours. Grease a plastic sheet and take a small orange sized ball and pat it to form a 4-5″ diameter disc of 1/2″ thickness.You need to wet your hands for easy spreading. Slightly press the edges with your fingers to give a nice circle.Make few holes in between. Transfer it carefully onto a hot tawa and pour oil in the holes and also around the edges and cover it with lid. You can smear some water on top of the thalipeeth,this will make sure that the thalipeeth would not get dry. Let it roast it on a medium flame for 2-3 mins, once it is brown at the edges turn to the other side and roast again. Repeat the same for the remaining dough to make thalipeeth. Serve it hot with Thecha, Mango Pickle, and salad. I used ready made flours, else you can get the grains and dry roast the grains before grinding it either in mill or mixer. Finely chopped vegetables like cabbage, methi leaves, spinach leaves or grated vegetables like cucumber, bottle gourd, radish to make thalipeeth. Heat 4 tsp oil till very hot but not smoking. Add turmeric, jeera and mustard seed to the oil. Oh what a rustic looking bread!! nicely done Valli!! Thecha looks super hot and love that bhajani flour mix. Thalipeeth looks wholesome and super nutritious. I have always loved thalipeeth with thecha..love the green chilly as well as the red chilly thecha..the clicks have really good and the thalipeeth is literally calling..really good. Love these multi-floured rotis. Yummy. and the chutney looks like the kind my husband loves. It is so much easier to mix all the flours for the bhajani. You got nice color on the thalipeet. Nicely done. 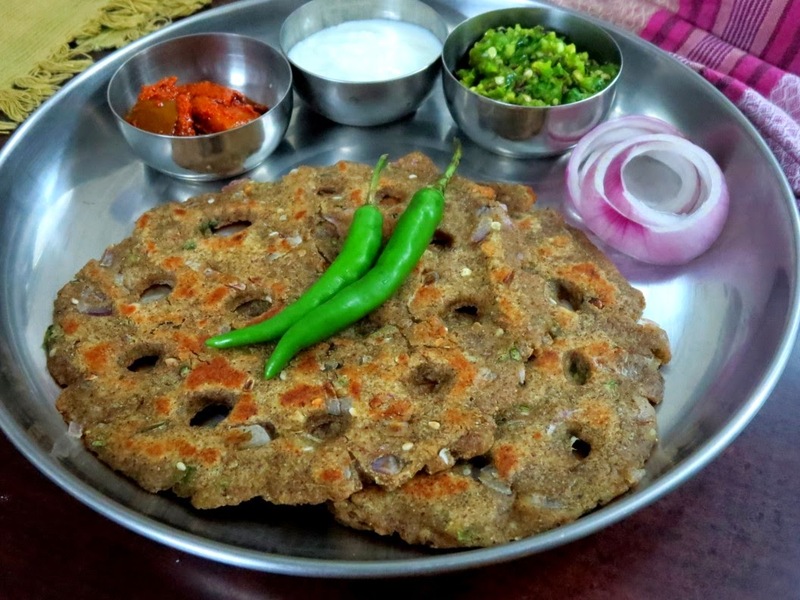 Healthy looking thalipeeth,delicious platter.Thecha sounds super spicy and perfect with thalipeeth.. Your clicks are tempting and thanks to your step by step pics I now know how to make traditional thalipeeths. 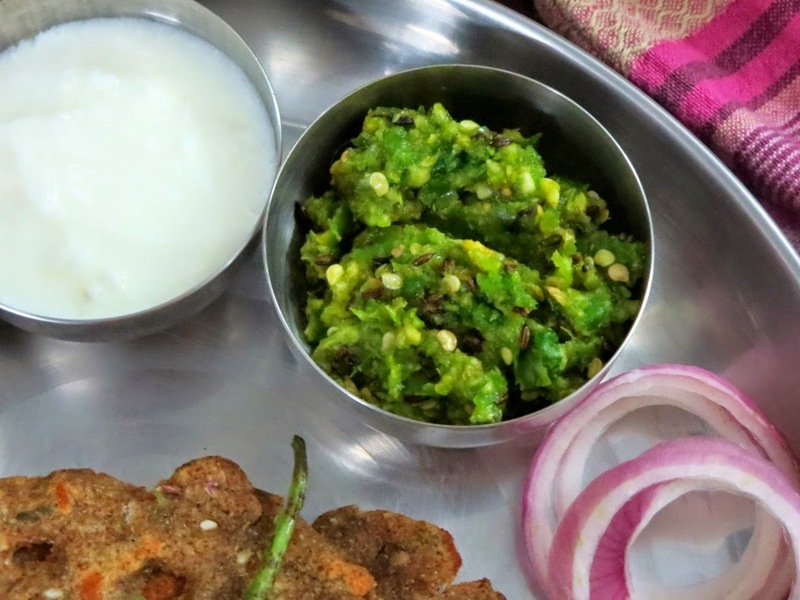 Deliciously made thalipeeth and thecha Valli. Yes to me too its Bombay, Calcutta, Madras. That thecha has my name written all over it.. All those green chilies and garlic, hmmm yum! Thalipeeth looks like healthy & delicious bread. I have a packet of thalipeeth bhajani in.my freezer, have to use it now!! Bread looks very rustic and oh my that thecha, awesome color! ! !